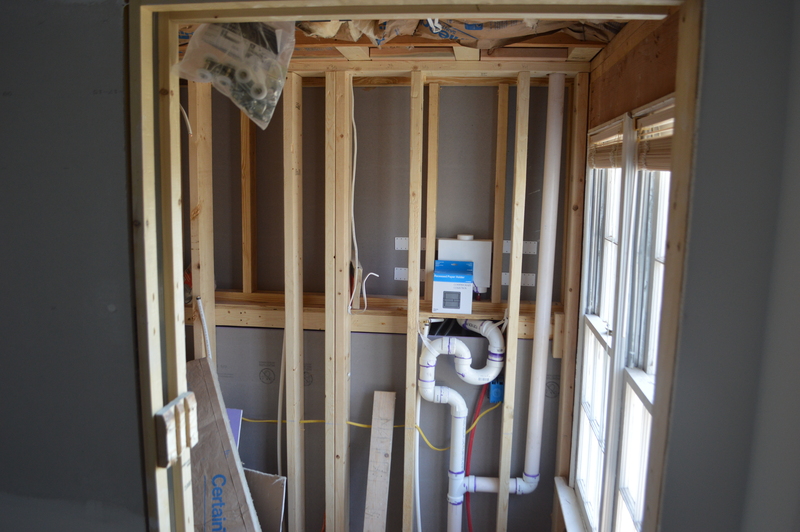 In addition to making walls in the master bathroom, the crew has made a lot of progress in a new bathroom we’re tucking in the back corner of the house across from Evie’s room. 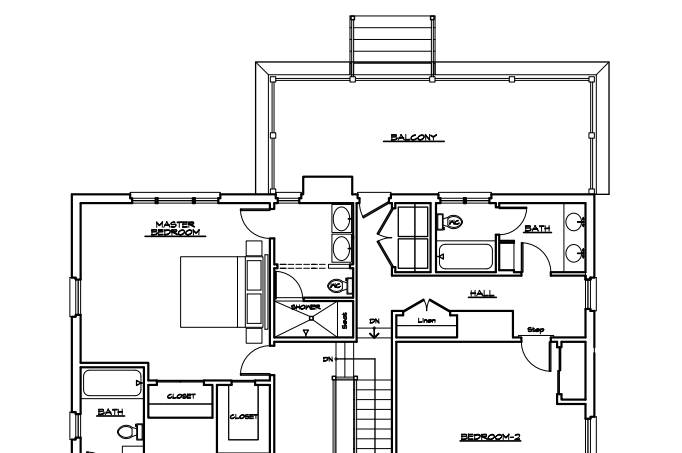 The idea behind the architectural drawings is that one day we’re going to build an addition coming off the right side of the house that will have another bedroom, so this bathroom will actually be for both Evie and whoever (good Lord willing!) lives in that bedroom. 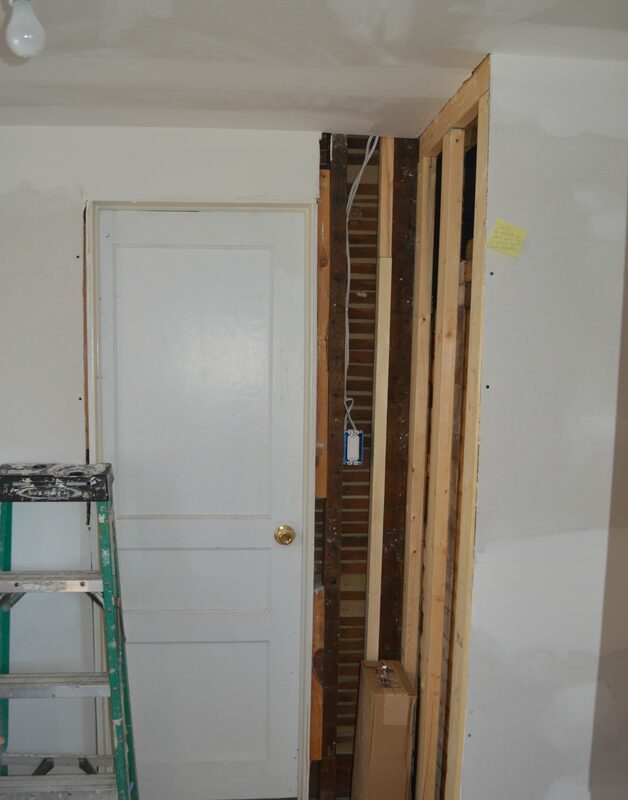 So all that to say– the architect didn’t really care where the window was placed in real life when he drew the plans for redoing the upstairs because in his mind we wouldn’t have a window at all anymore and just a doorway going into another bedroom. The window is not actually at the end of the new hallway, like it shows in his architectural drawings above. 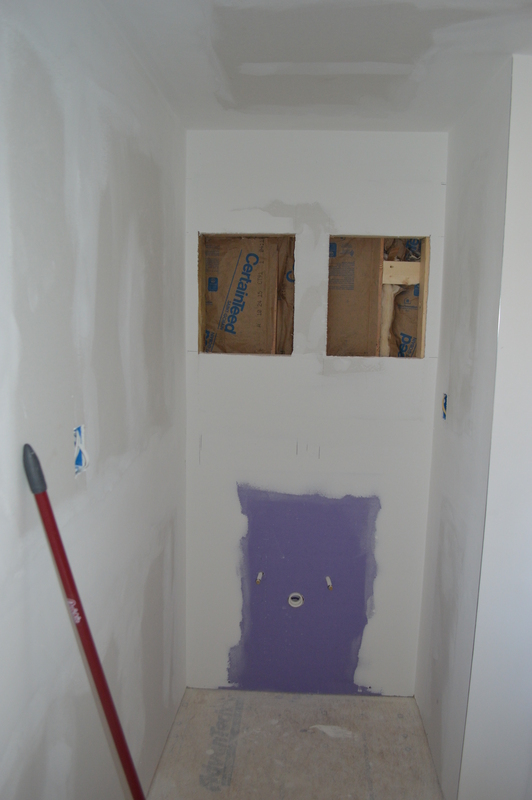 Instead it’s about 18″ over to the left of the end of the hallway, which presented an interesting dilemma when we were making the walls for the kids’ bathroom: do we bisect the window with a wall? We ultimately decided that instead of a large double vanity, we would put in a smaller sink and decrease that space so that we could fit in a wall on the outside of the window. I know that doesn’t make much sense… you’ll see what I mean in the pictures! 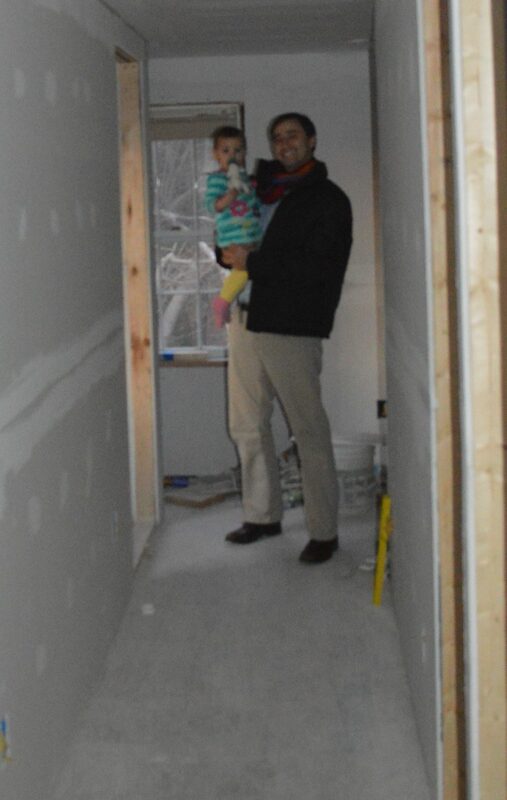 Below is a blurry picture (taken with my phone I think) of David and Evie standing outside the doorway to the new bathroom! See how the window kind of gets in the way? We figure eventually we’ll turn that dead space into a closet, but not until after we’ve built the addition and that feels like it will be at least a decade away haha. Above is the view looking from the bathroom to the doorway going into Evie’s room. And below is the view from the doorway of the bathroom looking in. 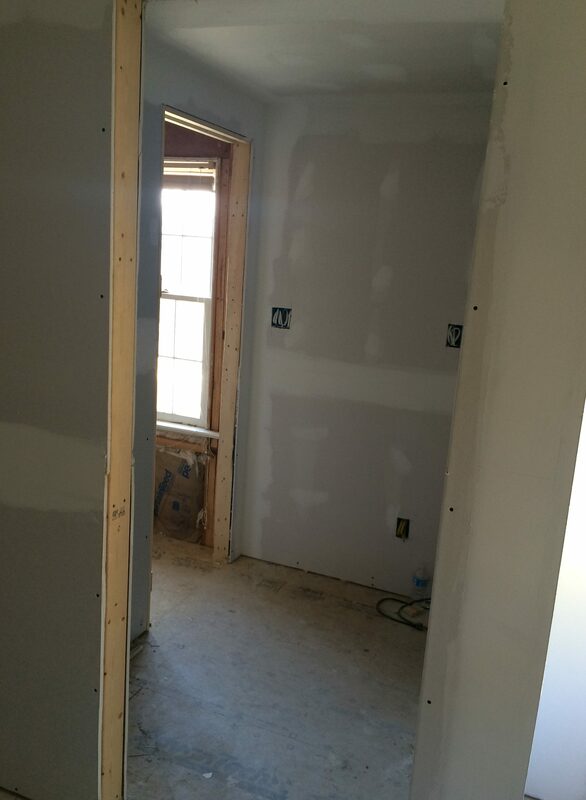 As you can tell, there are 2 rooms: one when you initially walk in (that will have the sink) and one to the left (that is separated by a door, which will have the toilet and the tub). In the panorama above I (the photographer) am standing by the sink area, which I’ll show you below in a second, and I’m looking at the hallway to the left and straight ahead is the room that will house the tub and the toilet. 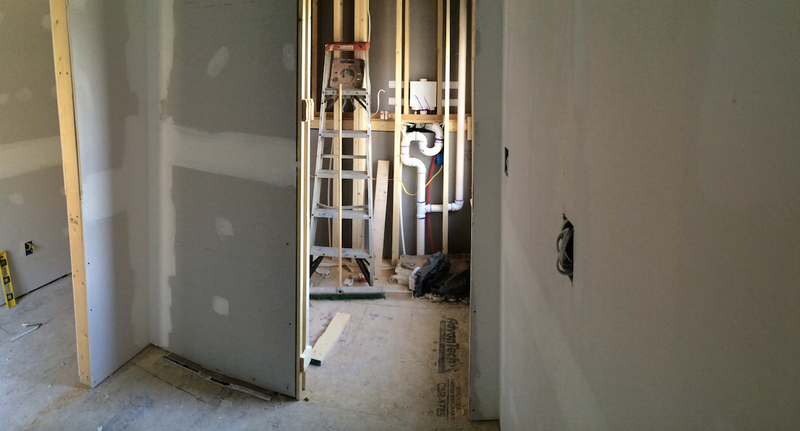 You can also see the plumbing for the washer and dryer in the unfinished wall straight ahead. Below is a close-up of that wall. Kind of complicated, isn’t it? And in the picture beneath is the area where the sinks will go! 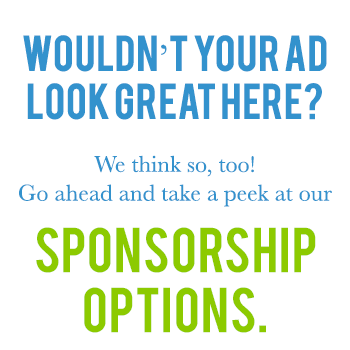 We’ve already got the cut-outs in the all for the two medicine cabinets.